Online services to backup, share or access files have become popular not only to home users but also in business environments. A cloud storage or online storage web service is used by many vendors, such as Amazon S3, Microsoft Windows Live SkyDrive, Google Docs or Picasa, Box.net, AT&T Synaptic Storage, Rackspace Cloud Files and many more. People who have accounts to these web storage services can use Gladinet cloud based storage services or products to easily access files as local drives or automatically sync or backup files without having to use a browser or any applications for each storage account. The version of the software in this Gladinet review is version 3.0.569.11801 and the edition is Gladinet Cloud Desktop Professional. This software is offered with two editions: Gladinet free starter and professional edition. Both edition runs on Windows XP, Vista, Windows 7, Windows 2003, Windows 2008 operating systems. Users of Windows Live SkyDrive must not enable HTTPS for Hotmail or a Windows Live ID account because it has known issues when accessing or mounting SkyDrive storage using Gladinet. This is not a requirement but a work-around until the vendor issues a fix. It's actually a known issue when third-party software will access a secure Windows Live account e.g. users of POP Peeper program is also recommended to disable HTTPs for Hotmail. So if you are going to access SkyDrive using Gladinet, disable HTTPS in https://account.live.com/ManageSSL. and cloud sync folder is also installed in Windows, after adding a web storage service account. 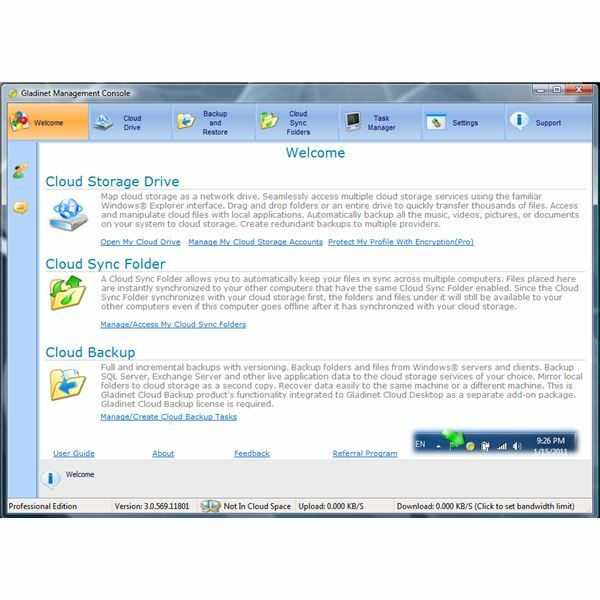 Cloud Drive – Make your cloud storage account as a local folder by mounting the online storage service in Windows. 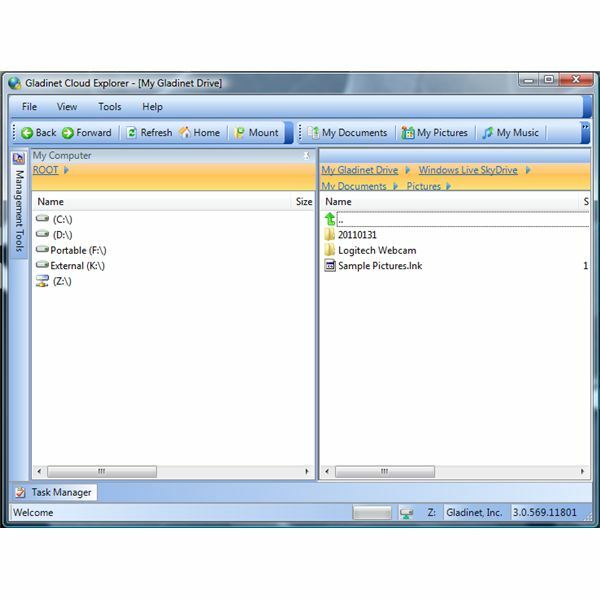 Cloud Explorer – You can use Gladinet Explorer to access or transfer files in cloud storage. You can also use the built-in Windows Explorer if you wish. Back and Restore – Schedule or automate backing up your files to a cloud-based storage account. 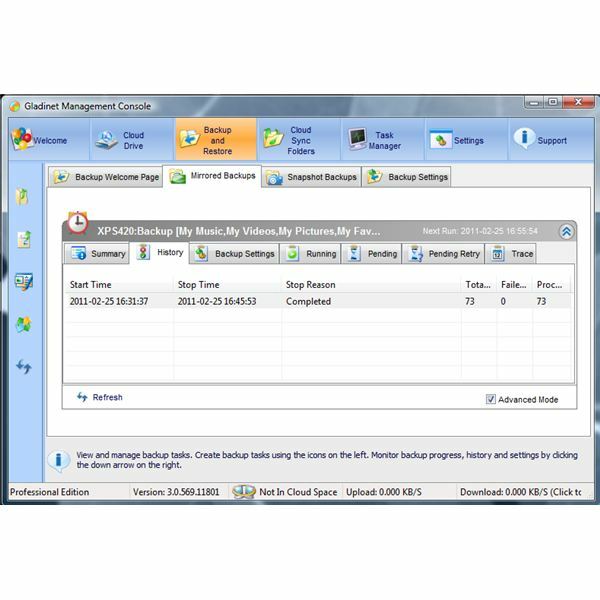 Cloud Sync Folder – Add folders or files to sync by Gladinet to a cloud-based storage account. In the above image, you will see that I was able to backup some of my files to Windows Live SkyDrive storage account without using a browser. Once the backup has finished, it will show in the history log so you can see if there's any failures. The memory usage of Gladinet reviewed here is quite acceptable. Gladinet only used 18 MB of memory while it was idle or waiting for any scheduled task. If Gladinet Cloud desktop is running e.g. backup files to a cloud storage account, the memory usage is still acceptable and does not lag the computer or other applications. The fast access to a cloud-based storage account is actually amazing. No freezes or delay as long as the web online storage servers are running fine. Home users will only have to pay $39.99 for Gladinet Cloud Desktop Professional with 1 home license. You can install the software to any computers at home. Business users needs to fork out $59.99 which can be installed in multiple PCs using a single license only, provided that you are the sole owner of the PCs. Installing Gladinet on a server OS requires one license per server. The above price is a good deal since 1 license is for all Windows (desktop, laptop or clients) that you own or manage. I usually access my SkyDrive online storage account using free SDExplorer (formerly known as SkyDrive Explorer), but will now use Gladinet Cloud Desktop because of neat features and the option to use the software for several online storage accounts (Google Docs, Picasa, SkyDrive and many more). 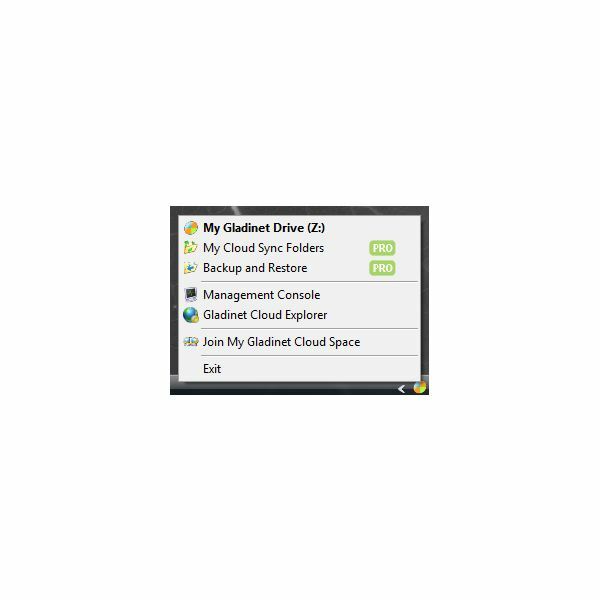 Gladinet Cloud Desktop is a must-have for users that are always using cloud storage services!